Familiar faces Andrew and Kirsty McCarthy have returned to the area and bring great news for visitors and everyone in the tourism sector. Rainbow Beach Horserides starts up in the beginning of March… well and truly ready for Easter holidays. Four horses were brought back from WA when Andrew was managing a station which carried over 17000 head of livestock plus progeny. We bought them with the intention to start this business -knowing that they were suitable for horse rides and working on a station. They have mustered under helicopters and worked in cattle feedlots. Also of benefit to riders is that they will always have two staff members on the tour so they can cater to individual riding abilities. It means one of them can stay with those that prefer to canter and the other with the walkers. 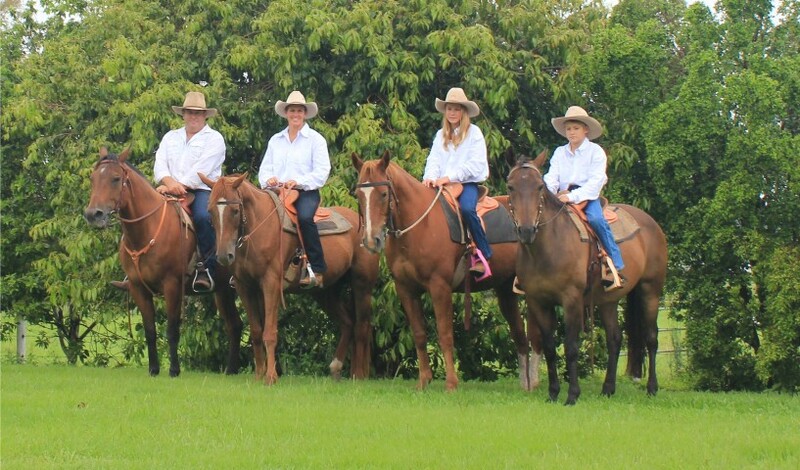 Their professional set up with quality saddles (almost all are new) are more comfortable to horse and rider compared to other trail rides. Andrew explains that “sore bits and pieces are greatly reduced” because of their focus on comfort. Their permit only allows up to ten horses per ride, in a location that is on the cover of 100 Best Beaches. “That’s where we’re riding – how can you beat that? A world heritage location!” he says. Kirsty’s Mum is well known Librarian Heather Robertson, who secured Principal of Rainbow’s school when Kirsty was in Grade 9. Andrew and Kirsty racked up over 20 years of surf patrols with time as Club Captain and various executive positions, and they plan to be patrolling again soon. Their children Courtney and Zac attended Rainbow Beach State School trip in 2008 and 2009. Now Courtney is at her parent’s old high School and Zac back at Rainbow and a nipper too. Phone 04121RIDES to book a horseride, Andrew and Kirsty know horses, know the area and are great for a nag (pun intended). They’ll make sure you have a magical ride on our beautiful beach.